Sleep apnea is a condition wherein a person's breathing momentarily stops and then starts again repeatedly while sleeping. These periods of not breathing, known as apneas, can occur up to 60 times per a single hour in a person who suffers from this condition. Apneas can last for less than a second, or last as long as 20 seconds. During this time, the brain is deprived of precious oxygen, and often attempts to kick start the breathing cycle by signaling the body to cough, choke, or even gasp for air. 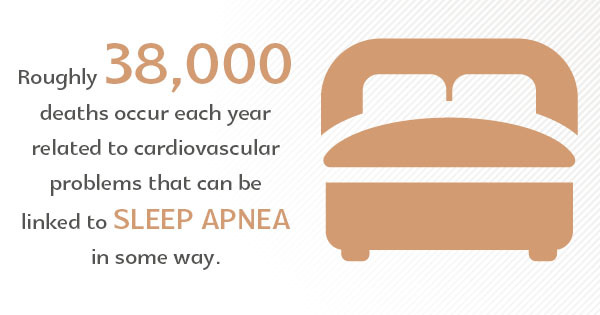 It's common for sleep apnea sufferers to be unaware they have this condition. Left untreated and undiagnosed, sleep apnea sufferers face a risk of stroke that is up to four time higher than those who do not have sleep apnea, as well as a risk of cardiovascular or heart disease that is up to three times higher. In fact, according to the National Commission on Sleep Disorders Research, roughly 38,000 deaths occur each year related to cardiovascular problems that can be linked to sleep apnea in some way. While sleep apnea causes vary from person to person, perhaps one of the most common sleep apnea causes is obesity. Maintaining a healthy weight can help alleviate pressure on the body's airway, which in turn, can prevent apneas from occurring. There are a number of highly effective treatment options for sleep apnea, such as nasal pillows and sleep apnea masks or machines. Sleep apnea machines work by providing a steady stream of pressurized air through a mask that is fitted over the nose and mouth.